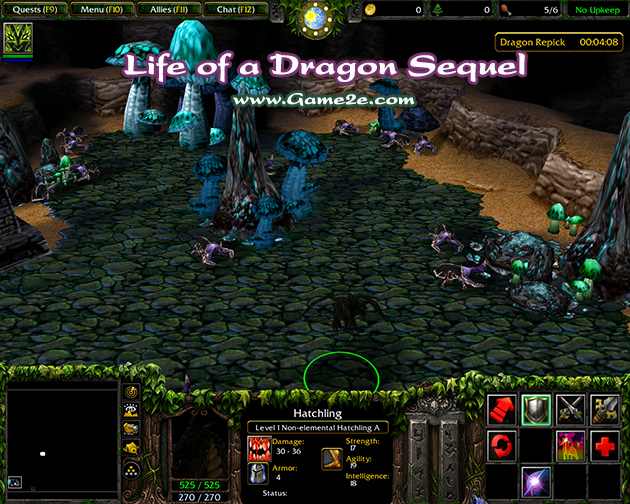 Life of a Dragon Sequel v2.2 is the successor to the previous Life of a Dragon. It is a Multiplayer RPG Map, though it can be played in singleplayer, it was made with the intention of multiple players. It takes classic RPG features and combines them with today's modern RPGs to provide a fair, but challenging, gameplay. Although previous versions of Life of a Dragon Sequel have been known throughout the Wc3 Roleplay Community they were always filled with numerous bugs, unbalanced, and incomplete content that I've abandoned upon the last made version, 1.1, 4 years prior. I've since returned... And gave Life of a Dragon Sequel an upgrade likened to an Expansion Pack. Including numerous Changes, Additions, Tweaks, Alterations, Balances, Fixes, and much more! Life of a Dragon Sequel is a Roleplaying Map, featuring numerous positions. The main gameplay revolves around the first five player slots known as "Chosen Dragons". While also including a "Dragon Slayer" a "Dragon Catcher", an entire "Human Kingdom" and "Fel Empire" as well as a "Mercenary" choice. F9 holds very helpful, grammar correct, Guides and Information. With numerous Commands for In-game Mechanics and Roleplaying. It is continuously updating! Chosen Dragon gameplay revolved around the player, a recently born hatchling, having greater potential than all other dragons and the ability to Grow. You grow at certain level intervals, but soon you'll have to choose a Color/Element to proceed. Gender Choice with a full working Mating System. Slayer and Catcher are Human Heroes with their own unique abilities and Upgradable Weapons. Slayer is Melee Based Male Hero, while Catcher is a Range Based Female Hero with the ability to capture "Chosen Dragons". Kingdom and Empire are vast nations, the Kingdom controls a majority of the region while the Fel Empire being the vice versa of the Kingdom. Mercenary is likened to Slayer and Catcher, with the exception of being able to choose a Hero he/she will like to be. The Game has a strict Hero Revival System. Where Dragon players (After a certain Mercy Level) will only have one free resurrection and then they are one-life only. Kingdom, Empire, Slayer, and Catcher have Altars, but they cannot be rebuilt when destroyed. While Mercenary has a 'Chance System' where upon death, they are brought back to the Hero Selection area.